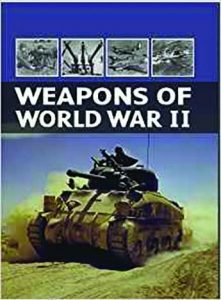 WEAPONS OF WORLD WAR II, by G. M. Barnes. Published by Skyhorse Publishing, Inc., 307 West 36th Street, 11th Floor, Dept. TGM, New York, NY 10018. Price: $14.95, plus shipping, also available at online booksellers. This 334-page softbound volume is really a reprint of a 1947 manual, probably originally written for distribution within the armed forces. It features an updated Editor’s Note on the author, an Introduction dealing with the Ordnance Department, an acknowledgment, preface, dedication, and five-page index. Described as a historical and photographic guide to the tools—ammunition, rifles, tanks, submachine guns, howitzers, motor transports, and more—this tome contains more than one hundred fifty vintage black-and-white photographs. Because the illustrations are copies, many tend to be a bit darker than new photos of the same object. However, they are clear enough to be useable for all but the minutest details. Not every small arm used by our military in World War II is featured in this tome. Most, if not all of the US Marines on Guadalcanal in 1942 were still using the bolt action M1903 Springfield rifle—probably the A1—as not enough M1 Garands had made it through the system yet. This rifle is not covered, although the M1903A4, known as the sniper’s rifle, is featured (illustrated). The M1928A1 SMG is featured, as is the M3 (grease gun), but not the simplified M1A1, except to state it was issued later. The illustrations are captioned, and each featured item includes a list of its specifications or characteristics, in addition to one or more paragraphs of explanatory text. Tables are sometimes featured and the one on Small Arms Ammunition covers 25 cartridges from the M24 .22 Long Rifle to the M19 12 gauge (the military lists it as 12 gage). Information provided includes Identification—bullet tip color or case—Bullet Weight, Pressure (psi). Velocity in feet/second, Accuracy (depends on cartridge), Maximum Range, Striking Energy in foot-pounds, Length of Trace (only for tracer rounds), and Penetration (only for armor piercing cartridges). This volume is a handy reference work for any student of World War II history. It is not overly technical and provides good coverage of the most commonly used equipment, plus on some lesser known tools, such as the amphibious jeep, “Little David,” and the M19 Swimming Device for medium tanks.